The city mayor said this move sends a message that New Orleans celebrates its diversity, inclusion and tolerance. 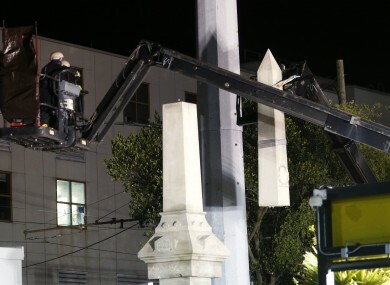 NEW ORLEANS TOOK down the first of four controversial Confederate monuments under cover of darkness early Monday morning, the latest removal of a widely perceived racist symbol of white supremacy in the South. Workers arrived around 1.30am to remove the Battle of Liberty Place statue, an obelisk first erected in 1891 to commemorate a failed rebellion against a racially integrated government following the Civil War. “The removal of these statues sends a clear and unequivocal message to the people of New Orleans and the nation: New Orleans celebrates our diversity, inclusion and tolerance,” Mayor Mitch Landrieu said in a statement this week. “The decision to remove these statues was made after a lengthy public process,” it added. The timing of the unannounced removal was designed to minimize protests by vocal opponents who had been staging vigils, the authorities said. Some city officials in the majority African-American city say they have received death threats. “The intimidations and threats from people who don’t want this monument down has been intense,” Landrieu said during a news conference on Tuesday, adding that a car belonging to a contractor hired to remove the statue had been set on fire. Workers removing the monument wore flak jackets and helmets as police snipers observed from the roof of a nearby parking garage. The city will remove three more statues — to Confederate Generals Robert E Lee and PGT Beauregard and Confederate States of America President Jefferson Davis — in coming days after a court struck down legal challenges. The monuments will be relocated to “a place where they can be put in historical context,” the city said. The mayor had issued an order calling for the four monuments to be relocated in February 2015 after the city council approved the plan in a 6-1 vote. In June that year, a white supremacist fatally shot nine African-American parishioners at a black church in South Carolina, prompting a national debate over Confederate symbols in the formerly slave-owning South. South Carolina took down the Confederate flag from its statehouse soon after. The University of Mississippi also removed its state flag, which included the Confederate emblem. But other institutions are still debating similar moves. The Liberty Monument is considered the most controversial of the four New Orleans monuments. A plaque the city added in 1932 said the United States had “recognized white supremacy in the South” since the Civil War. “Of the four we will remove, this statue is perhaps the most blatant affront to the values that make America and New Orleans strong today,” Landrieu said. New Orleans removed the obelisk from its location on central Canal Street more than two decades ago. Challenged by a lawsuit, officials put it back up at its latest, less prominent spot. Critics say the Confederate monuments should remain because they are part of the city’s history. But Landrieu said their removal was an important step for understanding history. Email “'A blatant affront to American values': New Orleans removes Confederate monument”. Feedback on “'A blatant affront to American values': New Orleans removes Confederate monument”.